Often described as "a clown in the cloak of a philosopher," the French Bulldog originated as, and continues to be used as a companion dog. The breed is small and muscular with heavy bone structure, a smooth coat, a short face and trademark "bat" ears. Prized for their affectionate natures and even dispositions, they are generally active and alert, but not unduly boisterous. 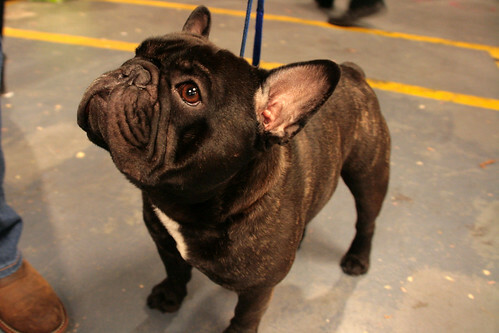 Frenchies can be brindle, fawn, white, and brindle and white. Frenchies are indoor dogs, but require air conditioning in warm weather. While good at alerting their owners to danger (Look! The UPS Guy is coming! ), their main role is that of lap warmer. The Frenchie requires minimal exercise and grooming.